Where Arizona Hospitality and Sunshine Greet You! Situated on the west edge of the hustle and bustle of the Greater Phoenix Area. Closest deluxe RV resort to Phoenix International Raceway and the Goodyear Cactus League Park. Cotton Lane RV Resort is a 55 Plus resort community. Our close proximity to shopping, sporting, and sight seeing venues provide you with many choices during your stay! Affordable daily, weekly, monthly and annual rates, Spacious Clubhouse, Pet Friendly Areas, Scheduled Activities Programs, and Indoor Heated Pool/Spa Area. 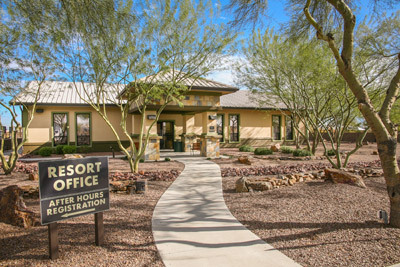 Take full advantage of our location and enjoy pristine desert living, scenic desert views and incredible sunsets. Make Cotton Lane "Your home away from home" destination! 17506 West Van Buren St. Copyright 2016 Cotton Lane Resort. All rights reserved.